_ The incredible characteristics of the Golden Orb Weaving Spider’s silk make it one of the most studied and sought-after product in the world. 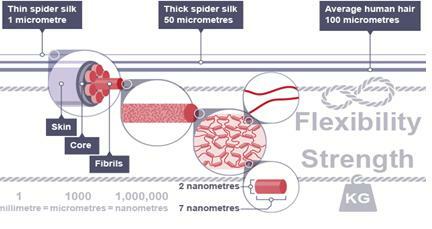 The chemical structure of the silk gives it a surprising strength, almost 5 times stronger than steel. The silk is also more elastic than nylon. During the day, the silk shines golden in the sunlight, attracting insects and bees. At night, the silk blends into the background foliage and acts as a camouflage. The Golden Orb Spider also has the ability to change the pigment of its silk in relation to the light levels of its environment and can change the color based on the range of spectral reflectance of insect vision.